I’ve been wondering what craft to post as the “first post”. 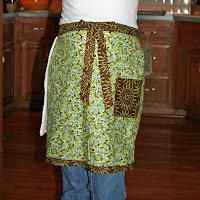 I thought an apron was appropriate – gets you into the Happy Homemaker mode. If you’re not sure, get a few apron books from the library and get inspired (I loved “A is for Apron”). You can also find a pattern, but you don’t need one. I just cut a rectangle of material, put a binding on the top and bottom for interest, added ties (they wrap around and tie in the front for some added interest) and a couple of pockets and a hand-wiping towel, and volua! This is a perfect project for a beginner sewer. So, I am totally stoked that you are doing this! I need all the help I can get and encouragement. I just need to get fabric and get started. I am VERY excited to see your stuff! So- my friend wants some of those adorable name bibs you made for me last year_are you game? I’m game for making anything! does she want to pick out the material, or just give me an idea of what she wants?? either way is fun – just let me know! Those bibs turned out way cute! !